I was a college and university Equine Science instructor for 10 years and a horse show judge for over 25 years as well as a private horse trainer and instructor. My husband, Richard Klimesh, and I maintain a website with hundreds of free articles at www.horsekeeping.com and enjoy our horses in Northern Colorado. 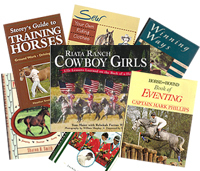 I started this blog on May 18, 2010 so that I could offer a Horsekeeping Newsletter again. (Sending it from our website became difficult with all the email blocks and bulk mailing problems so I had to discontinue it there.). Please feel free to SIGN UP FOR NEWSLETTER in the right column by entering your email address and clicking on the Subscribe button. You will then receive an email from my blog via wordpress which you must to respond to (click on the link in the email) in order for your subscription to be verified. Then you will receive my posts via email. You can leave comments or questions after any of the articles. I also invite you to use the Ask Cherry feature to ask your specific questions and I’ll do my best to answer promptly and use your question as an idea for a future post. My multi-talented husband, Richard Klimesh, producer of our DVDs, created this video bio about me which you might find interesting.